The 1964 World's Fair edition of the subway system maps included this illustration on the cover. Our first map is a scan of a USGS survey map of southern Brooklyn, originally drafted in 1888. Railways and trolley rights-of-way are noted. Courtesy J. Alan Septimus. The map is labeled as follows: "United States Department of the Interior Geological Survey". / "State of New York - Represented by the Department of Public Works". / "NEW YORK - Brooklyn Quadrangle". / "H.M. Wilson, Geographer in charge. Triangulation by the U.S. Coast and Geodetic Survey. Topography by the U.S. Coast and Geodetic Survey, N.Y.City Government, S.H.Bodfish, Frank Sutton, and J.W.Thom. Surveyed in 1888-89 and 1897 in cooperation with the State of New York." / "Edition of Feb.1900, reprinted 1948. Partial revision of shoreline 1924. Polyconic projection, North American datum. Brooklyn, N.Y. N4030-W7345/15"
Several different maps were published coinciding with the opening of the IRT subway in 1904 and its Brooklyn extension in 1905. 1904, Map and Profile of the IRT subway. The 1904 New York Subway Souvenir publication included a Map and Profile of the IRT subway. 1904, Map and Profile of the IRT subway. Another version of the Map and Profile of the IRT subway. 1904, Interborough Rapid Transit. The 1904 publication The New York Subway, Its Construction and Equipment featured this map showing the elevated and subway lines of the IRT. 1904, Plan and Profile of the Rapid Transit Subway. Century Magazine's "Building New York's Subway" article included a slightly different version of the same map. 1904, Map and Profile of Brooklyn-Manhattan Rapid Transit Subway Railroad. Route map and profile of the Contract 2 IRT extension to Brooklyn. 1904, Underground rapid transit routes proposed by the Metropolitan interests (PDF). "Underground rapid transit routes proposed by the Metropolitan interests to be operated under a free transfer system in connection with their three hundred miles of surface lines on Manhattan island." 1904, Interborough Rapid Transit Company Map, Showing Present Subway and Elevated Lines and Proposed Extensions. 1905, Profile Map of the New York Subway from Brooklyn Bridge to the Bronx. Ray Stannard Baker's 1905 article "The Subway Deal", included a profile map of the subway. Interborough Subway Map and timetable from the Official Guide of the Railways, Nov. 1906. Thanks to Mike Rivest for the scans. A 1912 BMT map shows BMT service prior to the Dual Contracts expansion. 1912 BMT Route Map (PDF). 1912 BMT Route Map (JPG). A circa-1920 representation of the tracks of the elevated lines in Manhattan. Drawn by Michael Calcagno. 1920, Manhattan and Bronx Els - 2nd, 3rd, 6th, 9th Aves..
Joe Brennan has put together two maps detailing the construction of the joint IRT/BMT subway in Brooklyn, circa 1920. Note, these are large images. The first map depicts the tunnel sections of the Contract 2 portion and the Fulton Street and Flatbush Avenue subway. The second map shows the Dual Contracts joint BMT/IRT line under Flatbush Avenue and the Eastern Parkway Subway. 1924 BMT subway-elevated route map. Note that the Canarsie line is incomplete from Montrose to East New York, but the extension to Canarsie (past Rockaway Parkway) is in service. The 4th Avenue (Brooklyn) and Nassau St. (Manhattan) subways are not yet complete. BMT sharing Flushing line service to its terminal at Alburtis Avenue. 1931 BMT subway-elevated route map. Canarsie, Flushing, Nassau, and 4th Avenue lines complete. All of the Els still operating. 1933 BMT subway-elevated route map. Not too many changes. Map dated by presence of Radio City Music Hall, which opened in December 1932. A 1930s-era map showing BMT Brooklyn and Queens Surface trolley lines. Thanks to Joe Korman for the scan. Here's an IND map from 1937 showing the IND World's Fair line, the completion of the "GG" crosstown, and the "HH" Court Street shuttle. The Fulton line was complete to Rockaway Ave.; no sign yet of the 6th Avenue trunk line. This 1939 IRT map shows the extensive network of IRT subway and elevated lines: East Side and West Side subways, 2nd, 3rd, 6th, and 9th Avenue Elevated lines, and the Flushing Line. Scan thanks to Richard Ondrovic. The 1939 IND map shows the 8th Avenue and Houston Street subways (the 6th Avenue yet to be completed), Fulton Street to Rockaway Avenue, the 9th St. subway in Brooklyn to Church Avenue, Queens Blvd. to Roosevelt Avenue, and Crosstown between Queens Plaza and Nassau Ave. Scan thanks to Richard Ondrovic. 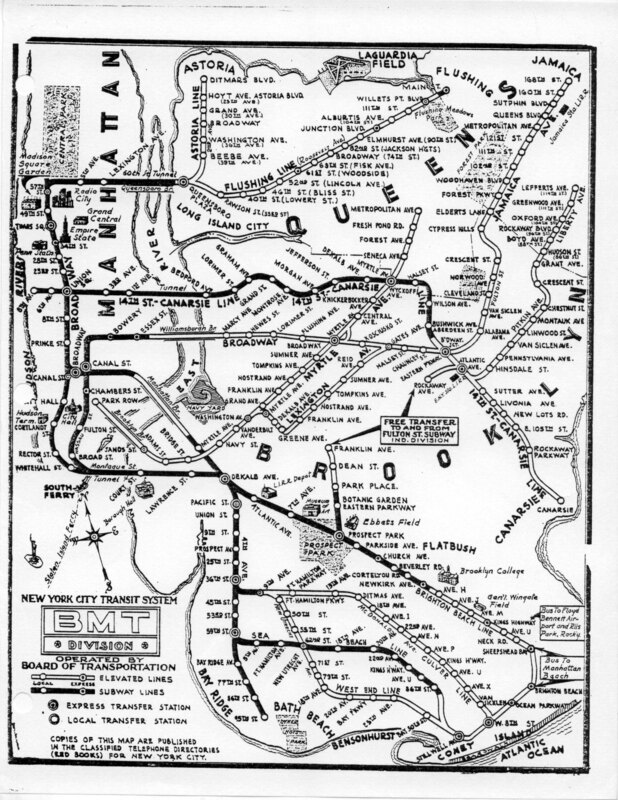 The 1939 BMT map shows the joint IRT/BMT Queens service, the Myrtle El, the Lexington El, Fulton El, 3rd and 5th Avenue El (all in Brooklyn), Brooklyn Bridge service to Park Row, and the longer Canarsie line. Scan thanks to Richard Ondrovic. Here is a 1939 BMT World's Fair special map which has photographs of other points of interest in NYC surrounding a map of the BMT elevated and subway lines. Courtesy Joe Korman. This 1939 system map (George J Nostrand/Seaman's Bank for Savings publisher, in the Hagstrom map style) shows the New York rapid transit system at nearly its most extensive configuration. Only the 6th Avenue el has been removed from service; the Brooklyn els are all still present, the IND lines completed (except for the Fulton past Rockaway Ave), and depicts Brooklyn Bridge train service and the 1939 World's Fair subway line. Note the errors depicting South Ferry and on the northern end of the Myrtle Ave el (it depicts the Myrtle tying into the Canarsie line not the Broadway line). This map also shows the BMT/IND connections at Church-Ditmas, and Queens Plaza, which, although proposed in 1940 didn't open until 1954. Thanks to Henry Kuck for the scan. 1940 BMT subway-elevated route map. Fulton El closed between Sands St. and Rockaway Avenue, replaced by free transfer to the IND Subway (which is not shown on the map). 3rd and 5th Avenue els also removed. Undated Brooklyn trackless trolley wire map. Courtesy Sanford Gardner. A 1948 system map, including route information for the three divisions. Joint IRT/BMT service to Astoria and Flushing is shown; 3rd Avenue El service in Manhattan still extends to South Ferry; the Fulton (showing thru service via Broadway and Lexington), Myrtle and Lexington Ave. Els in Brooklyn; Worth, 18th, 91st St. stations are still open on the Contract I IRT; Canarsie Trolley transfer. Thanks to Joe Korman for the scan. A 1940s-era track map of the SIRT system, showing the now-abandoned North Shore line. Drawn and contributed by Michael Calcagno. This 1951 map printed by New York Telephone shows the three competing systems (IND, IRT, BMT) in different colors, plus the unimproved elevated lines. Depicted are the 3rd Avenue El as far south as City Hall in Manhattan and the Bronx; Myrtle El and Fulton Avenue El (from Rockaway Ave. to Lefferts via Atlantic Ave.) (Lexington Ave. El is gone) in Brooklyn, Culver Shuttle line, Nassau loop service, and the Polo Grounds shuttle in the Bronx. Worth and 18th Sts. have closed. Thanks to Richard Ondrovic for the scan. A track map of the Manhattan Third Avenue Elevated just prior to its demolition in 1955. Drawn and contributed by Michael Calcagno. A 1959 system map, including route information for the three divisions. One of the first in the "new" schematic style. This map shows the 3rd Ave. El cut back to Bronx service only; the abandonment of the Bronx Park spurs of the 3rd Ave. and White Plains Road lines; the abandonment of the Polo Grounds shuttle; Culver Shuttle service is shown has having thru service from the 4th Ave. Subway to Ditmas; and service to the Rockaways (which started in 1956) is present with a "15c extra fare" notation. Thanks to Joe Korman for the scan. The 1964 World's Fair map, with the "Blue Arrow" motif, shows the Third Avenue elevated in the Bronx, the Myrtle Avenue elevated to Jay Street, Brooklyn, the Culver Shuttle, and Nassau Street loop service. This is a scan of the actual map, very high resolution 24-bit color. A 1966 system map, including route information for the three divisions. Similar to the schematic style of the 1959 map but with a lot more color. Very similar routes to the 1964 map. The Rockaway fare has gone up to 20 cents. Thanks to Joe Korman for the scan. The first in a new style, the 1967 map shows each line in its own color, and the Third Avenue (8), Myrtle Avenue (MJ), and Culver Shuttle (SS) lines are still running. The Chrystie Street Connection has just opened changing Manhattan Bridge service patterns, notably disconnection of the old Nassau Loop service. This map image is hand-redrawn by Michael Calcagno, patterned after the original map. A scan of the November, 1967 "New Subway Routes" map showing the combined IND and BMT Chrystie Street services. 1967 Chrystie Street "New Subway Routes"
This "pop up"-style foldout map was produced for the Irving Trust Bank (Nestor's Map and guide Corp) and dated July 1968, showing: Double letter locals (RR, RJ, JJ, QJ, TT, QB, MJ, etc. ), Chrystie Street service; express "F" service in Brooklyn, etc. The Bronx was depicted in three sections: north of Tremont Avenue was on the back side of the map in two halves, the three sections were pieced back together for this scan. The 1968 map shows shows the new KK service from 57th/6th to Broadway-East New York via the Chrystie Street Connection. Hand-redrawn by Michael Calcagno, patterned after the original map. Compare to the photo of the real map contributed by Chris Slaight. The 1969 map shows the discontinuance of the Myrtle Avenue (MJ) service between Jay and Broadway. Hand-redrawn by Michael Calcagno, patterned after the original map. This 1969 map of the Myrtle Avenue (MJ) depicts the line just prior to its abandonment and demolition between Jay Street and Broadway. Hand-redrawn by Michael Calcagno, patterned after the original map. Scan of a map from 1972, courtesy Henry Szablicki and Brian Hilley. This map from 1973 depicts the track work of the IRT #8 line - the Third Avenue Elevated in the Bronx - just before its abandonment and demolition. Hand drawn by Michael Calcagno. This map from 1974 shows each line in its own color. The Third Avenue, Myrtle Avenue, and Culver Shuttle lines are no longer in service. Hand drawn by Michael Calcagno. Hand-drawn map depicting MTA commuter rail service in 1974. The Culver Shuttle tracks prior to its abandonment in 1975. Map by Michael Calcagno. The 1978 map also shows each line in its own color. Major changes: elimination of the K train and the elimination of the 5, 6 and SS service from South Ferry; C and E terminal switch. Hand drawn by Michael Calcagno. BMT track map. Exact date uncertain but after 10/1977 and before 4/1985 based on the cutback of the Jamaica El to Queens Blvd in October 1977; Queens Blvd. itself closed in 4/1985. The Culver shuttle line is shown but service on it terminated 1975. 1987 service map based on Michael Calcagno's current map, updated by Dante D. Angerville. Michael Calcagno drew these three schematic track maps showing the trackage of the IRT, BMT, and IND divisions, circa 1996. A series of time-based route maps by Michael Calcagno depicting the various service patterns at different times of the day. Various past updates to Michael Calcagno's custom route maps. Robert Sklar contributes this homemade 2009 service diagram based on the 1959 schematic style. Various "single line diagrams". How to read a single line diagram. These are in JPG format typically scanned from photocopied reductions of the large diagrams and are thus, not the best quality. Dates vary. 6th Ave. IND: 34th St. to 47th-50th St.
Canarsie BMT: 8th Ave. to 1st Ave.
Fulton IND: Hoyt St. to Court St.
A circa-1940 New York City Omnibus Corp motor coach route map. Courtsey Hank Eisenstein. Part one lists hotels, government buildings, schools, churches, and has a closeup map of the theater district; Part two lists stores, bus terminals, hospitals, interesting views, fares, transfers, etc. ; Part 3 is the full map. 1969 Brooklyn & Staten Island Bus Map. Courtesy Hank Eisenstein. 1974 Culture Bus Loop Guide. Courtesy Hank Eisenstein. 1974 Manhattan bus guide. Courtesy Hank Eisenstein. Part 4: Battery to 68th St.
1976 Manhattan bus guide. Courtesy Hank Eisenstein. Part 2: 72nd thru 95th Sts. Part 3: 145th thru 193rd Sts. Part 4 14th thru 66th Sts. Part 5: Battery thru 12th Sts. Part 6: 96th thru 145th Sts.